The AFL ANZAC Day Clash is always a highly anticipated fixture of the AFL home-and-away season, no matter where both teams are situated on the ladder, an intense and emotionally-charged contest will be on display! The MCG turns into a sea of black & white and black & red as passionate fans pay their respects to the heroic ANZACs, and of course cheer-on their respective team amongst an intense, electric atmosphere! Irrespective of supporting Essendon or Collingwood, witnessing the AFL ANZAC Day Clash LIVE should be on the bucket list of all AFL fans! The iconic ANZAC Day Clash between two of the AFL’s greatest rivals in Collingwood and Essendon will be back again in 2020! This great AFL tradition will be celebrating it’s 25th anniversary in 2020, and is undoubtably the most anticipated home-and-away match on the AFL calendar. Much more than four points will be on the line as both teams will be competing for pride and honour in front of close to 100,000 passionate fans on the AFL’s biggest stage, the Melbourne Cricket Ground (MCG)! Dating back to 1995, the ANZAC Day Clash is a fixture steeped in tradition. 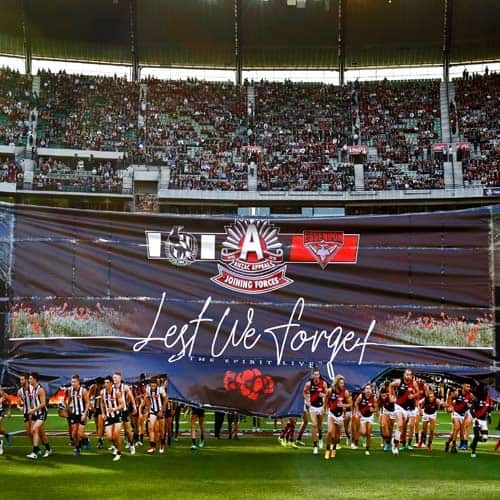 The idea was proposed by Essendon’s then-coach, the legendary Kevin Sheedy – Sheedy believed that the AFL’s two biggest clubs (at the time, Essendon and Collingwood) should go head-to-head on ANZAC Day. With the support of the Returned and Services League (RSL), Sheedy believed it would be a great way to commemorate the day. Since the first meeting in 1995 (incredible, which was a draw), Collingwood have been victorious 13 times, and Essendon 9. The AFL ANZAC Day Clash is highlighted by perhaps the most important ANZAC Day tradition, the playing of the The Last Post, followed by a minute of silence occurring prior to the start of play. These special traditions build an incredible sense of emotion and reflection throughout the MCG, as teammates stand side-by-side directly facing their opposition in a spine-tingling and eerie moment of commemorative silence. Once both the Australian and New Zealand national anthems have been proudly sung, the MCG’s siren sounds and the crowd’s roar is deafening! It’s safe to say players of both clubs thrive on the electric, emotionally-charged occasion and a scintillating contest is inevitable! You can enjoy the full ANZAC Day Clash experience with Sportsnet! Not only will you receive reserved seating to the 2020 AFL ANZAC Day Clash, your experience on the day will begin in the best way possible by attending the Essendonian pre-game brunch which includes a three-course meal, drinks after 12pm (as mandated by liquor licensing laws on ANZAC Day), live music and entertainment, special guests and more! Please register your interest by completing the Enquiry Form below so that when our 2020 AFL ANZAC Day Clash packages – including official tickets, accommodation and more – are released, we can send you a notification with a link to the packages. If you like the look of the packages you can then chat to one of our friendly travel experts to discuss the packages and your travel requirements in further detail! 1 nights accommodation at a selection of Melbourne CBD hotels. Check In: Thursday 25th April, 2019. Check Out: Friday 26th April, 2019. Return coach transfers from Palladium at Crown Entertainment Complex to the MCG. Reserved Seating at the MCG to the ANZAC Day Collingwood v Essendon clash on Thursday 25th April, 2019.